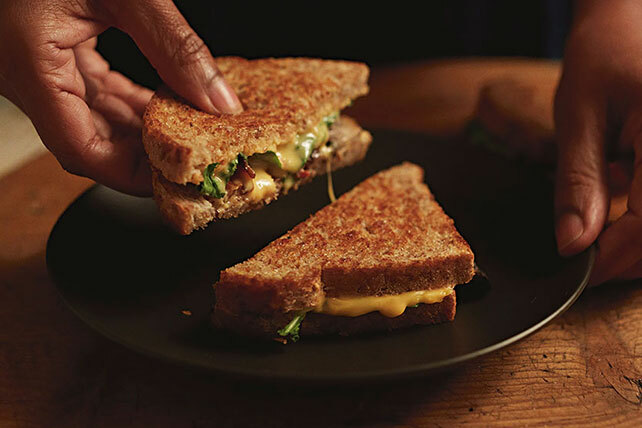 Just when you thought nothing could be better than grilled cheese with bacon—along comes this sandwich made with buttery, sautéed mushrooms. Melt 1 tsp. butter in large skillet on medium-high heat. Add mushrooms; cook and stir 5 to 6 min. or until tender. Remove from skillet. Fill bread slices with mushrooms and remaining ingredients to make 2 sandwiches. Spread outsides of sandwiches with remaining butter. Prepare using OSCAR MAYER Turkey Bacon and KRAFT 2% Milk Singles. Substitute 1 Tbsp. KRAFT Real Mayo Mayonnaise for the softened butter.